Includes all the features of the Commander XP, without the compass. If you''re after the brightest optics for absolutely unparalleled performance at night or in low light conditions, consider the brightest binocular made: the Commander XP. Steiner has created new HD (High Definition) optics that deliver over 96% peak light transmission — the highest ever recorded. Combined with the bright and steady 7x50 configuration, you get nighttime images so brilliant, it''''s'' almost like turning on a spotlight. Each Commander XP is hand-built to be mil spec waterproof and shock resistant. 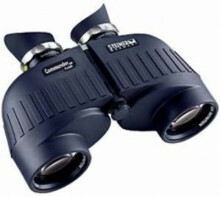 Click the button below to add the Steiner 7x50 Commander XP Marine Binoculars to your wish list.